Mindfulness has now become so popular, and is such a buzzword, that many people are calling it a “fad.” A quick Google search for “mindfulness fad” yields 230,000 results. While that may or may not be true, I am quite certain that the mindfulness fad will not be going away any time soon. To use the word “fad” in relation to mindfulness is actually a misnomer. A fad is something that rises to popularity very quickly, and then loses its popularity just as quickly. The popularity of mindfulness has been growing steadily for a few thousand years. In the West alone, the practice has been slowly gaining popularity for about 60 years. Also, with fads, there is a craze around some thing or some interest that may or may not provide a benefit. When there is some benefit, it is usually very superficial and short-lived. One of the main criticisms of the popularity of mindfulness is that big companies may be teaching it to employees in a very “fad-like” way. The concern is that companies are teaching mindfulness to employees as though it is a sort of quick-fix for stress, with the hope of increasing the productivity of employees, instead of addressing the underlying causes of the stressful workplace environments. In most cases, I don’t think this argument is a good one. Most of us create stress in almost any environment we’re in. I’ve spent time training in monasteries — arguably the most peaceful places on the planet — and the monks are often able to create stress out of the most benign situations. This is simply human nature, and one of the reasons we need mindfulness training. If we can create stress in a monastery, it would be safe to assume that we could create stress for ourselves in even the best workplace culture in the world. Providing employees with a tool that helps them to create less stress; to be more resilient to unpleasant, stress-inducing circumstances; and to realize greater happiness, seems like a good idea to me, regardless of the motives of the leaders of the company. Would we criticize a company that offers paid time to exercise and free healthy food for employees because the motive of the leaders is to increase productivity? We might, actually, if we believed that the leaders of the company were trying to squeeze unhealthy amounts of productivity out of employees and offered the exercise programs and healthy food as a way to help employees withstand the stress of the added workload. I think we’d all agree that this is not a very kind way to treat employees. I believe that this is the exception and not the rule. In most of the cases I’m aware of, the leaders of the companies offering mindfulness have practiced mindfulness themselves, realized great benefit, and want to give employees a chance to realize those same benefits, such as with Aetna CEO, Mark Bertolini. Even if a company were to offer mindfulness to employees in a fad-like way, as a quick stress-reduction tool, and with the intent of squeezing more productivity out of employees without examining the underlying causes of stress in their workplace, I see this as more of a positive than a negative. Although the motive of the company may just be greed, the results would still most likely be good in the long term. When people benefit a little from the practice, they tend to learn more and practice more. This brings us to the main reason mindfulness is not a fad, and certainly won’t be going away anytime soon. The reason mindfulness training can do so much is that it changes how the mind functions. The key determinant of nearly every outcome in our lives is the quality of the functioning our minds. For instance, in our professional lives, knowledge is certainly helpful. However, we all know people who know a lot, are very smart, and who are nevertheless terribly unsuccessful because they don’t deal well with people, or lack self-control, or don’t deal with emotions well, or all of the above. All of these abilities depend on the functioning of the mind. In our personal lives, we know that two people can respond to the exact same event in two entirely different ways. One person can thoroughly enjoy an experience that another person abhors. Thus, we can see that our happiness depends much more on the functioning of the mind than on what happens to us. 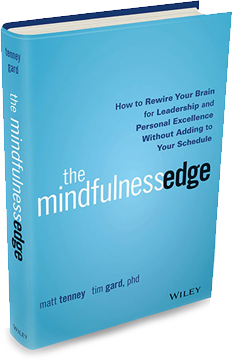 As we progress deeper with the practice of mindfulness, we discover that mindfulness is not a quick-fix, fad-like tool for magically feeling better and performing better at work. We discover that those benefits arise gradually, with continued practice. But we also discover that mindfulness is gradually uprooting the principle obstacle to an optimally functioning mind: Living as though we are our thinking. Most of us live as though we are the voice in our heads that is constantly blabbering away. When we live this way, we are the victims of our thinking. If our thinking is positive, things go well. If our thinking is negative, things don’t go so well. When we operate from the perspective of mindfulness, we see that we are not our thinking. We discover that we can observe and listen to thinking with complete objectivity, as though it’s on a heads-up display. When we see and listen to thinking objectively like this, it can no longer consume our attention against our will. Although this is a very subtle shift, it is the shift that fundamentally changes the functioning of the mind. There are many ways that we benefit from this shift personally and professionally. Some of those benefits are listed above. But the reason mindfulness is going to continue to grow in popularity as long as there are people on this planet is that the shift to mindfulness helps us meet the two deepest needs we have. This shift to mindful awareness of thinking is the key to better personal and professional relationships. When we’re not caught in our thinking, we are able to be fully present people. This helps us to empathize with people and understand their needs. Thus, people feel heard. They feel more loved. Perhaps the most powerful thing we can do to receive the kind of loving relationships we all yearn for, is to love others well in the this way. The shift to mindfulness also helps us realize happiness that doesn’t depend on any external conditions being met, even the condition of relationships with others. We can actually be happy under any circumstances. Our thinking is what determines whether an experience is “good” or “bad.” As mentioned above, this is why one person can enjoy an experience that another person abhors. When we see and listen to our thinking objectively, it no longer has any control over our emotional response to an experience. We may be experiencing something unpleasant, and our thinking may be unpleasant, but we can see and hear that thinking as though it was on a TV screen in a room a quarter mile away. It simply has no effect on us. People may come to the practice of mindfulness for fad-like reasons, looking for quick fixes to superficial problems. But if they actually do the practice correctly, they will discover what people have been discovering for thousands of years: The quality of our lives is determined by the quality of the functioning of our minds, and mindfulness training gradually develops an exquisitely healthy mind capable of most effectively loving others and living a meaningful, deeply satisfying life.